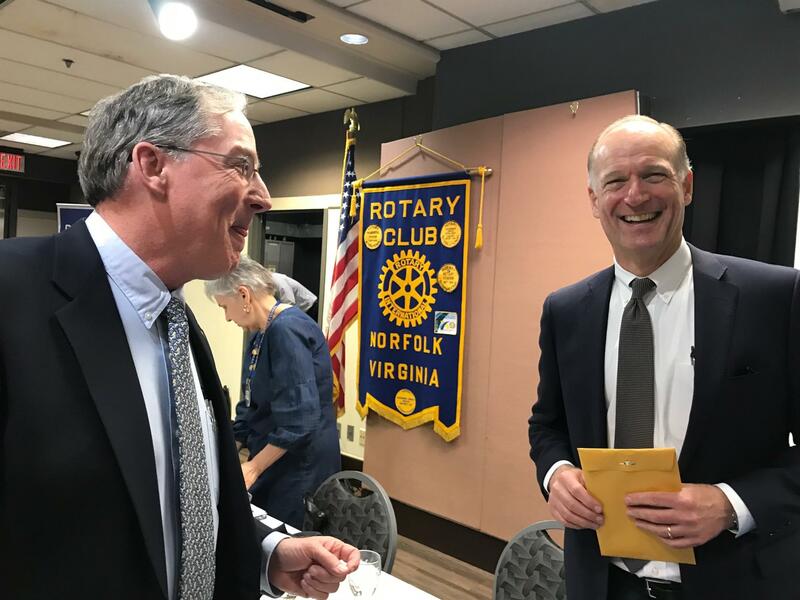 Doug Wilson (r), CEO of Elizabeth River Crossings, chats with Rotarian George Compo. Doug Wilson, our speaker, was briefly introduced by Gary Boswick who highlighted his educational expertise in finance, including a Masters from Wharton, and his employment by private equity organizations. Mr. Wilson dove right into his thesis: that the ERC was about much more than two tunnels. It was about addressing the transportation needs of this area by expanding and maintaining the downtown and midtown tunnels and also constructing and maintaining new roads connecting the tunnels to our adjacent highways. He began by giving a brief history of the construction of the original tunnels, noting that the downtown tunnel was built in 1952, the midtown tunnel followed in 1962 and the downtown tunnel was expanded in 1987. Unfortunately, the needs of the adjacent cities for expanding and improving the tunnels grew faster than the state’s appetite for financing these improvements. Congestion, deferred maintenance and falling tax revenues after the 2009 “Great Recession”, all made it difficult for the state to fund the approximately $2.1 billion needed to finance the expansion of the tunnels, adjacent roads and to catch up on the deferred maintenance. His employer, private equity investors, stepped in to fill this void by negotiating a contract with the Commonwealth during Governor McDonald’s administration. The result was the completion in 2016 of the new midtown tunnel, upgrading and improving the existing downtown and midtown tunnels, and expansion of adjacent connecting roadways. Wilson emphasized that ERC’s operation was much more than the two tunnels but also included the adjacent roadways and the extensive staff and operators needed to maintain and manage the assets, including the 4 tunnels, the MLK extension, 61 lane miles of roadway, 27 bridges, 21 overhead structures, 100 safety cameras, 13 signs, 10 inspection stations, 40 pumps, 64 jet fans, 12 transformers, 11 generators, 40 vehicles, 9 ponds, and a current staff of over 200 people. All at an estimate cost of more than $2.2 billion over the 50 year plus contract. Clearly, the ERC is more than just tunnels! There were over 36.8 million trips through the tunnels in 2018, and more than 250,000 pay by plate motorist statements each month. He also indicated that the tolls today were less than the original 1952 tolls of a quarter, if adjusted for inflation. Mr. Wilson reminded us that his company invested the equity capital that the state was unwilling to invest, and ERC also assumed the risks related to construction, maintenance, operating costs and revenues meeting projections. In sum, one has to commend Mr. Wilson’s candor in speaking to our club on what is for many an unpopular topic and for some, a sore point. Of course, the fault, if any, is not with his company, but with our elected officials who pursued or allowed the pursuit of the private equity approach rather than financing the needed improvements via state funds. The meeting was called to order by President Pam who called upon Sigur Whitaker, with Frank Whitman assisting on piano, to lead us in our opening songs. Bob Powell gave the Invocation and President Pam led us in the Pledge of Allegiance and the “Four Way Test.”. Joey Rothgery encouraged us to keep in our prayers the Harry McCoy family including daughter and son-in-law, Martha Lee and Mark Shaw. Joey also recognized Chuck Spence, who was present for the meeting and who has been recovering from shoulder surgery. Our area governor, Dave Rosenthal, was introduced, and presented to President Gary Boswick an official Citation letter signed by Ian H.S. Riseley, Past President, Rotary International, along with a new Rotary Citation patch for our club banner. 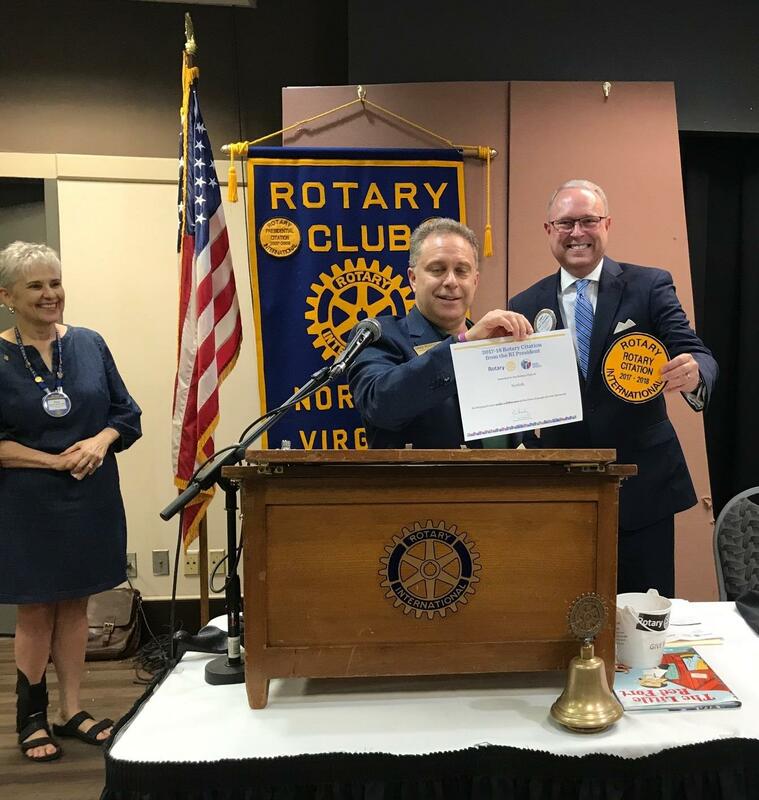 The club citation recognizes the club’s outstanding achievements during the 2017-2018 Rotary year under Gary’s leadership. We also inducted into our membership Dr. Berhanu Mengitsu of Old Dominion University. Welcome! Unfortunately, President Pam also announced that Ph.D. candidate Ashley Molinaro will be graduating from ODU and moving to Washington, D.C. next month. She will be greatly missed, especially for the leadership she provided on our numerous volunteer opportunities. Fortunately, Rachel Bellis will be filling the role of keeping us all advised on the projects. Please check our Rotary website for upcoming events and opportunities. Sally Hartman and President Pam encouraged us to get behind our major fund raiser, “Suds and Buds”, on May 17th from 5:30 p.m. to 9:30 p.m. at the Norfolk Botanical Gardens. Please consider ways you can support the project through recruitment of sponsors, purchasing tickets for yourself, family and/or friends, donating wine, and volunteering for the event. Proceeds will benefit Norfolk Rotary Charities, Lee’s Friends, and the Norfolk Botanical Garden. We also were reminded of Rotary Baseball Night, the annual District 7600 fundraiser for End Polio Now, coming up on Thursday evening, May 2nd. Bill McInnis will have tickets available for sale next week. Game time at Harbor Park is 6:35 p.m. Get ready to wear your red "End Polio Now" t-shirts! Visit our website calendar for more details. President-Elect Lorna Cochrane gave a report on the work of the Norfolk Rotary Charities Grants Committee, which reviewed nearly 50 requests seeking over $131,000.00 and awarded 23 applicant grants for a total of over $41,000. She also reported that members of the Grants Committee visited the recipients to present the checks. Your Rotary dollars put back into our community! President Pam recognized several PHFs for their continued support and awarded PHF pins to the following: Bryce Burton (+2); Alan Nelson (+2), Tim Lawrence (+1), Gus Stuhlreyer (+3), and John Lynn (+5). Unfortunately, John Lynn has also recently moved out of state: he, too, will be greatly missed. Ann Baldwin gave another plug for her passion, "Literacy”, and the Grammar Book that she has available for distribution. Please contact Ann for a copy. Timing was running short, so “Happy Bucks” time was cut short, but not before several Wahoos celebrated the University’s National Basketball Championship by offering some comments and more “Happy Bucks”! Go Hoos! Chuck “Hoo” Spence continued his winning streak with the lucky raffle ticket. Our meeting on April 16th will feature Norfolk Public Schools Superintendent, Dr. Melinda J. Boone.